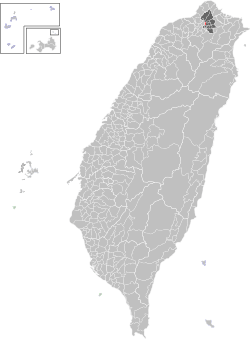 Datong District or Tatung is a district of Taipei City, Taiwan. It is located between the Taipei Metro Red Line and eastern shore of the Tamsui River, and between Civic Boulevard and the Sun Yat-sen Freeway. 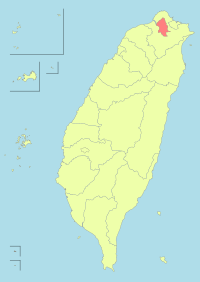 The southern part of this area used to be the site of Twatutia, one of the first settlements in what is now Taipei and for a time the area's commercial center. The Dihua Market has many buildings built during the Japanese colonial era. The Taipei Confucius Temple is adorned with southern Fujian-style ceramic adornments. Taipei's commercial center has since shifted south east to Zhongzheng, Da'an and Xinyi, and Datong is far less important economically. One of the last vestiges of Twatutia's commercial importance disappeared with the closing of the Chien-Cheng Circle in 2006. The north was the site of the village of Daronpon. During the Qing Dynasty, the district was named Daronpon (Chinese: 大浪泵; Pe̍h-ōe-jī: Tōa-lông-pōng), Paronpon, and other variants, but was renamed Toaliongtong (大隆同; Toā-liông-tông) in 1844. Following the Second Opium War, a port was opened in Twatutia for international trade. Foreign trade resulted in the economic development of the district. In 1946, the name was changed to Tatung (大同; "Great Unity"). In 1990, the district merged with neighboring Jiancheng and Yanping Districts to create today's Datong District. The district is named after the Confucian notion of utopia. It is most notable for its Japanese period and Qing period architecture, especially along Dihua Street. 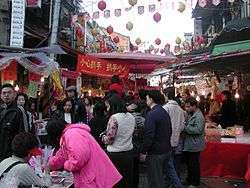 It is also famous for the Dihua (Tihua) Street Market during the Lunar New Year holidays. The market sells dried fruits, nuts, dried meats, dried seafood, snacks, and health drinks. 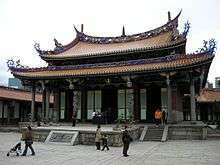 Other attractions in Datong include Tianma Tea House, Museum of Contemporary Art Taipei, Customs Museum, Lin Liu-hsin Puppet Theatre Museum, Taipei Confucius Temple and Bao-an Temple in the Dalongdong area, and the Xiahai City God Temple near Dihua Street. Datong also contains the Yongle Market (also on Dihua Street), Ningxia Night Market, Yansan Night Market and Dalong Night Market. TransAsia Airways used to have its headquarters in Datong District. Datong is served by the Taipei Metro Red Line and Orange Line. It is also served by the Songshan Line. By road, the district is served by National Highway No. 1, Provincial Highway No. 1, and Provincial Highway No. 2. It is also the location of the Taipei Bus Station, the largest bus terminal in the city. 1 2 3 4 5 "About Datong District". Taipei City Government. 2010-01-11. Retrieved 2010-07-18. ↑ "foot_01.gif." TransAsia Airways. Retrieved on January 7, 2011. "Address: 9F, No. 139, Cheng-Chou Rd., Taipei 103, R.O.C"
↑ "09-guestbook.aspx." TransAsia Airways. Retrieved on January 7, 2011. "地址：台北市大同區103鄭州路139號9樓"
Wikimedia Commons has media related to Datong District, Taipei.